Sometimes, planning a vacation can be a treacherous tide! 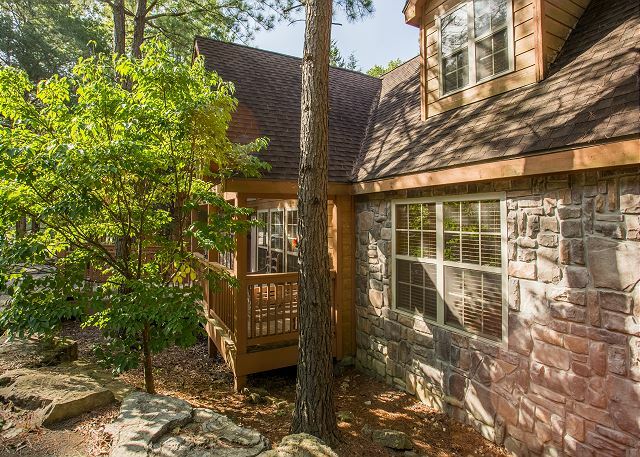 Thankfully, this beautiful cabin is all you need to find calm waters. Step into a regal retreat, located in the beautiful Stonebridge Resort. 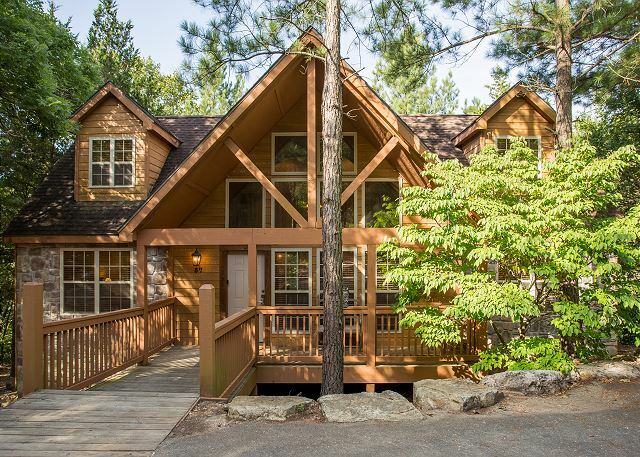 This 4 bedroom cabin is super spacious, so there's no chance of feeling cramped or crowded in this lovely abode. 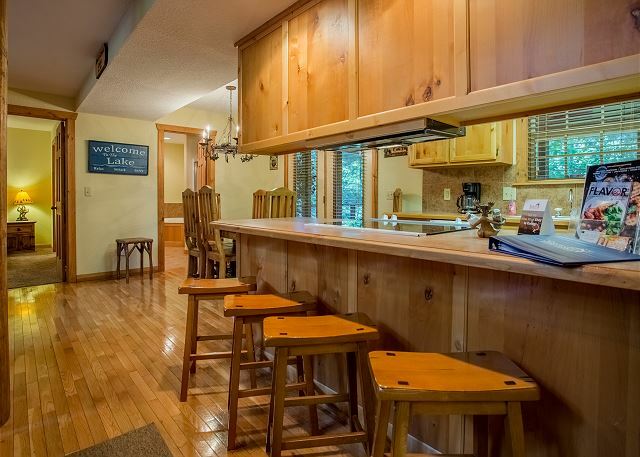 With hard wood floors and unique décor, this is a rustic escape from all the hustle and bustle of your busy life. 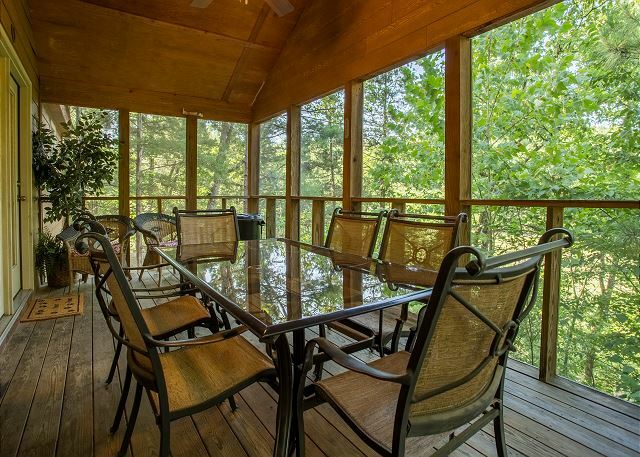 Take a moment in the screen in porch and sip from a mug of freshly brewed coffee, made in the full kitchen. Update your blog and tell everyone about the fun day that you have planned using the complimentary wi-fi. Make sure to take Fido on a walk of the beautiful nature trails. That’s right: this cabin is pet friendly, meaning your favorite furry pal can have a vacation with you! 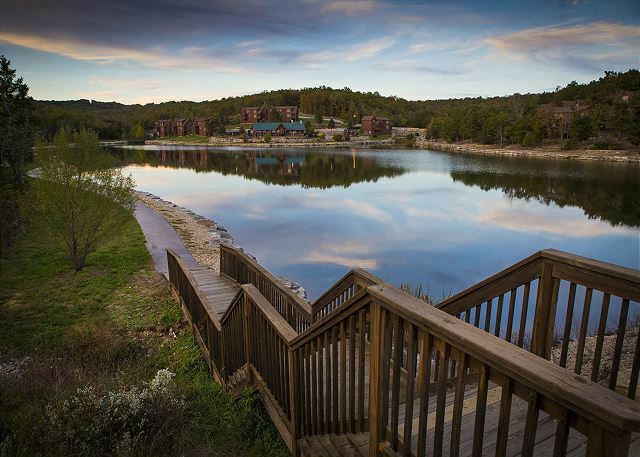 There is much to see and do in the Ozarks, be it adrenaline-pumping or relaxing in nature. Take a short drive to Indian Point Marina, where you can rent a boat and make a serious splash at Tablerock Lake. For the thrill seekers, take a trip to Silver Dollar City, home of several heart-stopping roller coasters and rides that are sure to make your day a memorable one. 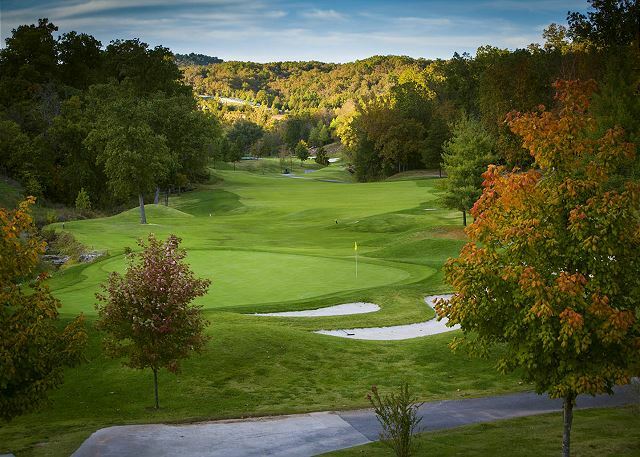 No matter who you are or what you want to do, you can find the perfect destination in the Ozarks. I had my children and grandchildren celebrating Thanksgiving and we enjoyed the accommodations. The living room and kitchen are rather small for 10 people and cooking a large Thanksgiving meal together. We still enjoyed our time together and were able to eat at the large deck table as the weather was warm. All the bedrooms and baths are very large and comfortable. The park is right down the street! Rachelle, that sounds like the perfect Thanksgiving. We are thrilled to hear that you had such a great time staying with us, and we hope to host you again on your next vacation to the area! This unit was as described and cleaned as expected. Having stayed in several units in this area, there is no grass around the Lodges for walking dogs. This one was just a short distance from several, nice grassy areas which was nice for the dogs. 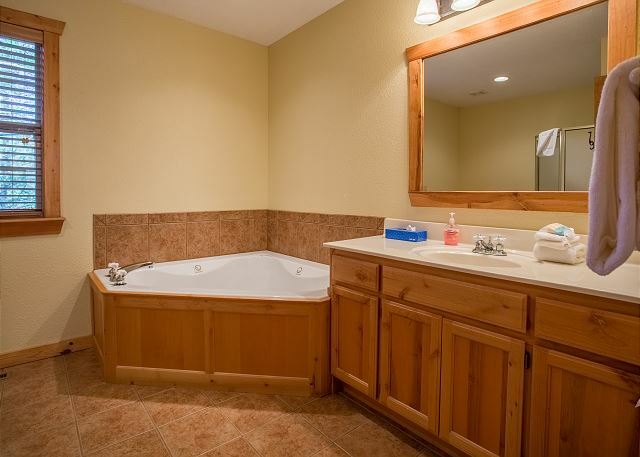 The bad experience was on my first attempt to use the whirlpool bath in the lower fireplace side bedroom. Turned on the whirlpool and gobs of awful black leafy stuff quickly filled the water. Horrible. I turned it off, drained the tub and had to shower. I still felt awful and none of us used any of the whirlpool tubs after that. We are glad to hear that your stay was clean and satisfying, Deborah! However, that unfortunate situation with the Whirlpool sounds awful. Thank you for bringing that to our attention. We are going to look into the issue to make sure that doesn't happen again! This is our second time to rent this cabin. We love it here & are so pleased with the condition of the cabin. We come twice a year & plan on continuing to rent River&#x2019;s Creek. Had a wonderful time! 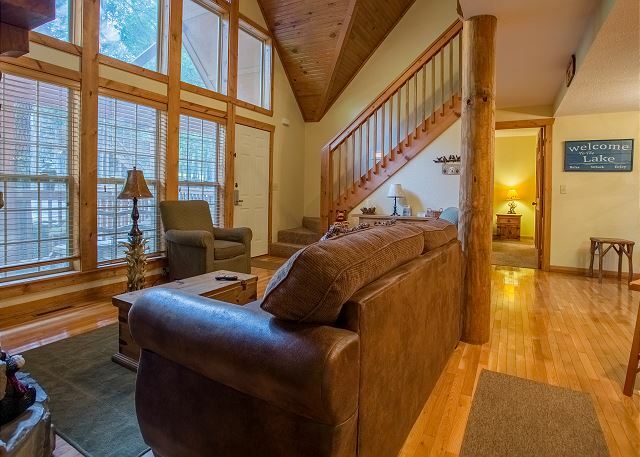 Cabin was perfect for 4 couples (sibling retreat) and in excellrnt condition. Perfect stay all the way around! My family and friends have been coming to Rivers Creek for 3 years now. We love the area and the cabin so much! We also bring our lab and she really appreciates the "Pet Friendly" cabin too! We definitely plan to be back next year! 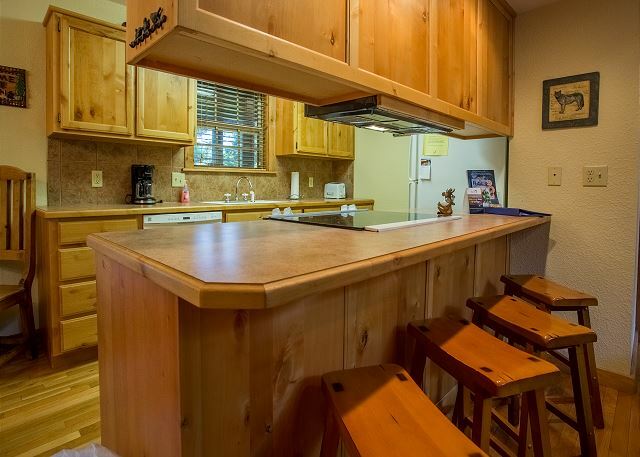 The cabin accommodated my family of 13, just wish there was more seating in the living room for a large family. Also wish there was a map in the cabin noting where the pools, playgrounds and fishing pond were located. But overall stay was nice.conveniently located to Silver Dollar City. We would stay there again. We stayed for MSU graduation. Our family enjoyed the large rooms and comfortable beds without noise. Very peaceful and homie cabins. We really enjoyed our stay at River's Creek. It's a great location in a beautiful area. It's just a few minutes from Silver Dollar City without the traffic jams yet close enough to go into Branson. Hi, Cindy! Thanks for leaving us your review! We're so glad you enjoyed River's Creek, and we hope to see you again. Don't forget to mention your previous stay with us for a special returning guest discount on your next Branson vacation! We had a great time in the Ozarks. We usually visit in late-October, but came earlier this year in late September. The weather was perfect with warm days and cool nights. We enjoyed returning to the lodge after a long day of fun in Branson, to prepare dinner together, eat and play games on the screened in deck with the family. Beautiful scenery, quiet and cozy location! It was a lovely area to walk the dog and see the squirrels scurry about while getting in our cardio on those glorious hills. Excellent and friendly staff to work with and a beautiful lodge. Thank you Sunset Nightly Rentals for another great getaway!! This is the 2nd year my family and I have come over Labor Day weekend to enjoy the Rivers Creek cabin! We absolutely love this little home away from home....and we definitely intend to make this a tradition! Next year we plan to bring more friends with us and perhaps rent the cabin next door or across the street. 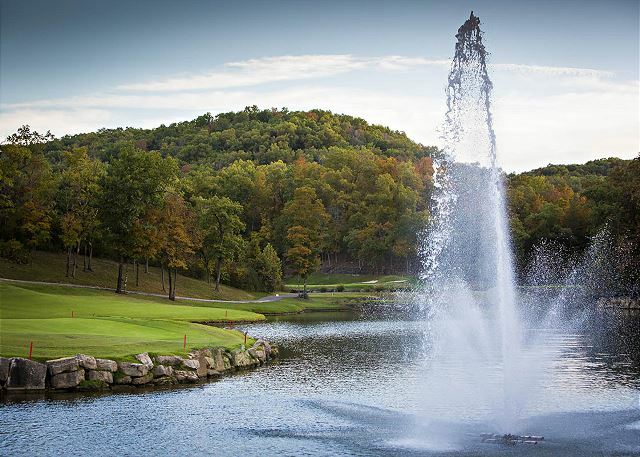 The Stonebridge property is so beautiful and located 20 minutes from everything Branson has to is perfect! See you next year! Hi, Roukaya! We're so glad that we continue to impress you with River's Creek. It's always a pleasure to have you as a guest, and we can't wait to see you again. As always, we have a special returning guest discount waiting for you when you return! :^) Thanks again! The house was well maintained and roomy. Only one suggestion--the living room was small for the number of our party, not enough sitting space, and the sleeper couch had cushions that kept slipping out of place. Otherwise the house was very nice, comfortable, and well maintained--loved the screened porch! Great house. Enjoyed our time. Disappointed that the screened porch didn't have solid lower rails to stop a child from falling through. We weren't able to spend time on the porch as hoped. I enjoyed my stay. The house was clean and comfortable. Everything was just right. Jacque was really helpful. I think I called her about 10 times with questions but she was always really nice. My only complaint is my trip wasn't long enough lol but that's not their fault. Hi, Rocondra! We're so glad you enjoyed your stay with us, even if it wasn't as long as you would have liked! We'll have the door open to you when you wish to return, and be sure to mention your previous stay for a returning guest discount! We had eight couples and rented two units. 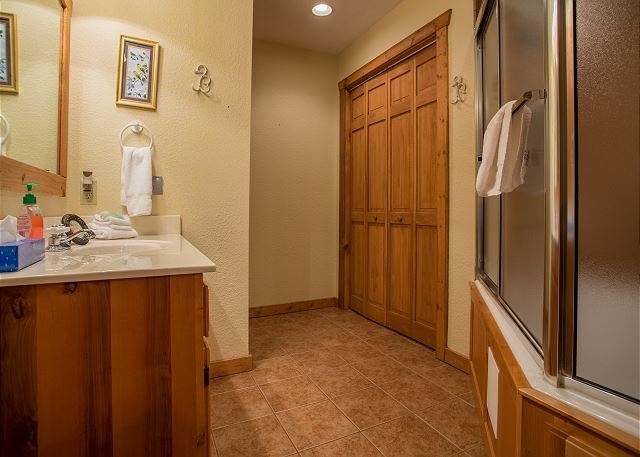 Nice separate bedrooms and bathrooms for each couple! We weren't in the units much, but was a beautiful setting to stay. Good morning, Larry! We're so glad you enjoyed your stay at Stonebridge. We can't wait to have you back in Branson, and when you decide it's time for another trip, make sure to tell us about your previous stay for a returning guest discount! Good afternoon, Kim! We're so glad to hear that you enjoyed your stay with us. We can't wait to see you again, please tell us about your previous stay with us for a returning guest discount! Place was great and the location was perfect. We do not like to stay in condos because we take our small dog with us on trips. We have 15 year old twins and they enjoyed their own room with their own king size bed. We will be back. We have stayed in several Lodges as a family. This was the first time at River's Creek. Very clean and everything was in good shape. Parking was a little tight for all of our cars. We enjoyed our stay with just a few issues with the property:It had a bad odor throughout(possibly dead rodent).The refrigerator was leaking water inside onto our food items.The microwave was used Friday morning and worked fine. We tried using it Saturday morning and it would not shut off nor warm anything up so we had to unplug it completely.The jets in both upstairs bathrooms had not been cleaned properly. There was black mold shooting out into the water & there was a yellowish/ orange film in the jets.There are squirrels (or other rodent) living in the attic, of which they scratch around and make noise all hours of the night/ early morning. We had a great time in the area, perfect accommodations for our family. It was great to be able to wash a few clothes and eat in! The only minor negative was that the signage in the neighborhood was a little difficult to read and figure out when we first arrived, but once we found it we were fine! Lynette K. from Hanna City, IL. Had a wonderful stay. 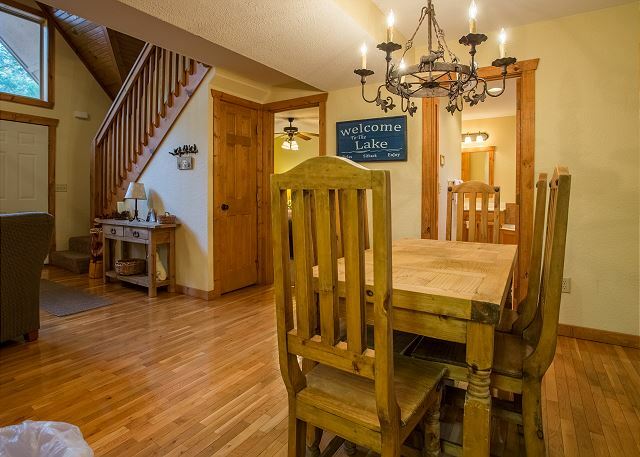 4 couples, plenty of together time and plenty of privacy! Perfect for a girls' weekend trip! Very peaceful and relaxing. Beautiful house and surroundings! My family and friends had the most wonderful experience this weekend! The Sunset cabin at Stonebridge resort was fantastic. The cabin was clean, well equipped with all of the amenities a family could need and very cozy! We felt right at home. Also the surrounding area was clean and well kept. The only thing you might think about adding is a grill of some sort. We will definitely be back! House was clean, bright, & spacious. Loved the screen porch. Guard at gatehouse on first check-in was crabby, but all others were really nice. Excellent! The only thing I would recommend is to have a grill at every cabin. Kind of an inconvenience to go up the road. Also, more toilet paper and paper towels. We have stayed at this cabin before and love it. It is perfect for our family that includes my husband and me, our two adult children with their spouses and our four grandchildren ages 8-3months. We love the layout of the cabin, as well as the location. The only thing I noticed this year was that some of the beds are feeling a bit worn. 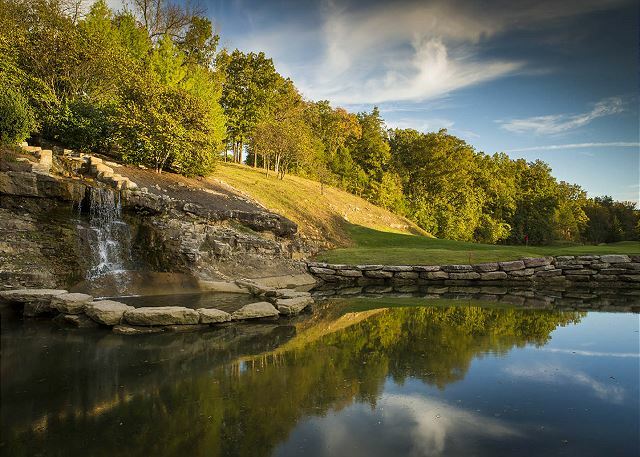 Stonebridge is a beautiful resort in a beautiful area. We especially like how close it is to Silver Dollar City and how convenient it is to go into Branson West for dinner or essentials. We will most liketly return. Perfect for our large group. Amenities were great except for the fishing lake. It is completely overtaken with watergrass. Kids were disappointed. We were super happy with our cabin! There was so much room (there were 6 people in our party), and everything was gorgeous and clean. We will definitely stay here again! Close to food restaurants and shopping. Beautiful view. Overall great vacation. Only downfall was shower water did not get hot enough but other than that would definitely stay again. Wonderful, we had a great time and there was plenty of room for everyone. We had a fantastic fishing trip and this cabin was perfect for our family! We met some family members in Branson and we all had plenty of space. Bedrooms and bathrooms were all good size. Kitchen had everything we needed to cook our meals. We appreciated the extras found in the cabin like games, wii, bug spray, pet bowls, etc. The wifi was fast and easy to connect. The property surrounding the cabin was beautiful and quiet. We've never stayed so far from the strip before but it didn't bother us. It felt secluded and relaxing. Short walk to grills and park for the kids. We had to drive to the pool and the pond but we enjoyed both.We would definitely recommend this cabin! Can't wait to return! This was our first attempt with a multi generational family vacation. The cabin was spacious enough to accommodate everyone. Clean, well maintained and very nice. 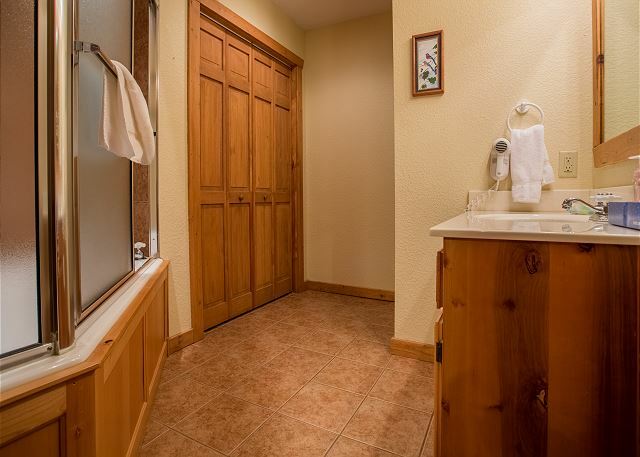 So nice for each family to have their own bathroom. We will definitely return and very highly recommended with excellent resort amenities for a family with teens to toddlers. River's Creek Lodge was very spacious for our family of 11. Parking 3 vehicles was tight. Map for locating pool should be clearer. Very enjoyable & would rent lodge again. Refrigerator had a problem of leaking water down on food and the handle fell off.We also had centipedes in our bathroom almost daily.Flat rock at the far end of the parking area was loose and my wife fell getting into our car when she stepped on it. GREAT VACATION WITH THE FAM! We were extremely pleased with our rental property. There was something for everyone close by. We made a lot of family memories in this nice home. 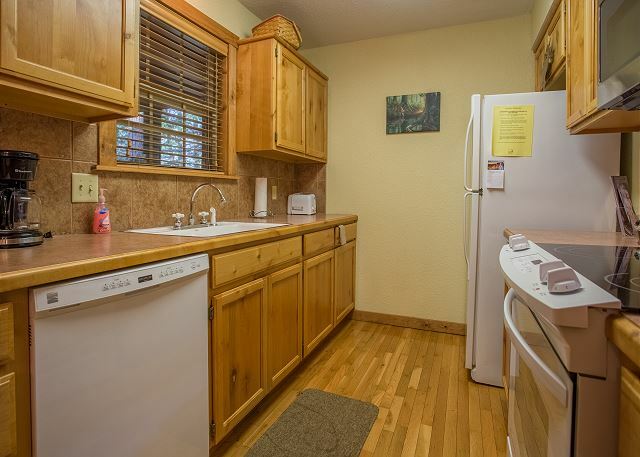 Needs some updating and the kitchen appliances need replaced or fixed. The toaster didn't work, refrigerator leaked, we didn't have dish soap, bathroom doors didn't latch closed, couch was very uncomfortable, and ran out of hot water. The lodge was very nice. This property worked great for our family of six adults and five children, plus the family dogs! Excellent facilities in the Stonebridge complex and the lodge was well stocked for supplies. Only bad thing was the soft lumpy mattresses and lack of AT7T cell phone coverage. Had to rely on WiFi for communication. There were no mosquitos which was quite nice and our grandchildren enjoyed the creek. Thanks, Roger. Sometimes the cell phone coverage in this part of Stonebridge can be spotty due to the lay of the land but the beauty and serenity of the area makes up for being incommunicado for a bit. We'll pass along your suggestion about the mattresses to the owner of the lodge. We hope that you will come back and see us soon! My family recently stayed at this cabin in Stonebrige. There were 6 adults and 3 small children. The layout of the lodge was perfect for us. I really liked the open living area with the bedrooms being separated from each other. We enjoyed two of the pools on the property each day. We spent most of our time near Stonebridge and Branson West. Silver Dollar City is less than 10 minutes away. This was possibly our best family vacation to date and my favorite rental property we have stayed at. We had a minor problem with the key lockbox that was very promptly fixed. All in all - a great stay! We stayed at a 4-bedroom lodge with our extended family. It was a beautiful lodge in a wooded setting. Our weekend was wonderful. We fished in the lake and took many walks in the area. The air was cooler than expected in July so we didn't use the pools. 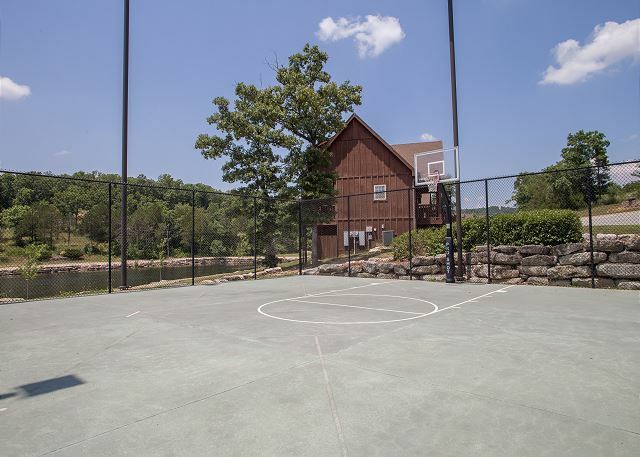 This location offers easy access to Indian Point on Tablerock Lake and to Branson. Very clean and spacious unit, we stayed in a 4 bedroom condo and every one was impressed. It was only 5 minutes from Silver Dollar City which was helpful. Would difinately stay here again. This cabin was wonderful. 4-bedrooms with 4 king size beds with 4 jacuzzi's. Who could ask for more? 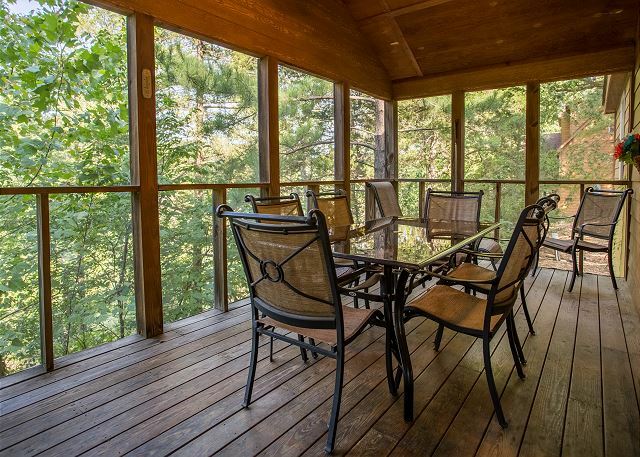 The back deck was enclosed so you got to enjoy the wilderness without the bugs. This cabin was worth the price for everything we got and how many people it fit. A lot cheaper than a Hotel. 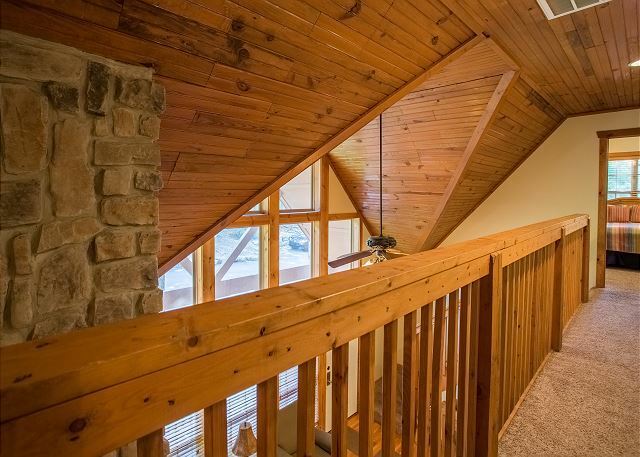 This was a beautiful cabin nestled in the woods, yet close to Branson attractions. It was very spacious, extremely clean, and completely relaxing; far more than I anticipated. 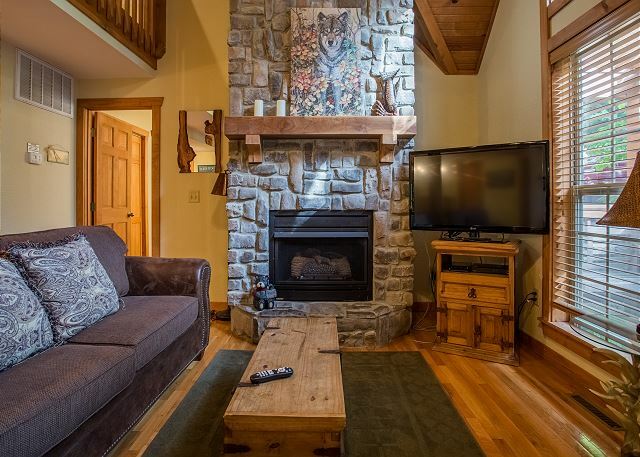 The fireplace and sounds from the creek out back added to the enjoyment of this stay; it was as life's stresses were a world away. I highly recommend and hope to return! Thank you for the review, David. We are glad you enjoyed your stay and found our process easy and convenient. I'll have the Operations Supervisor check out the hot water situation in this lodge. We hope to see you back soon! This property was great and was in a great location, although we would have preferred to have been just a little closer to events and dining places. There were no significant problems, but what was discovered was reported to Sunset Rental upon departure. Thanks very much for accommodating us so well and treating all contacts professionally. This was an excellent stay for our group. Thank you, William. We are glad you and your group had a good time. We hope to see you back soon! 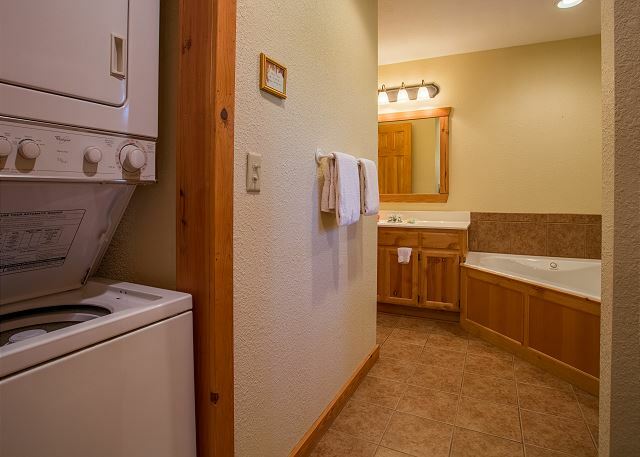 We were very pleased with the proximity to Silver Dollar City and the privacy of having a lodge. We were pleased with everything except the quality of the kitchen appliances. The microwave made a terrible noise, and the dishwasher was very noisy. The appliances definitely need to be replaced. The large screen tvs were very nice. as was the large screened in porch. Thank you for your review, Barbara. I will ask the Operations Supervisor for this property to check out the appliances and talk to the owner of the lodge about any needed repairs/replacements. I am glad that you enjoyed everything else about the property and hope to see you back in Branson soon! 4 girls, 4 bedrooms with private baths! Perfect for a girls getaway. Almost had to cancel due to health problems with 3 hubbys, but got it in..minus one day. Easy check in and check out. Was concerned that we would have to forfeit our monies which would be VERY upsetting, so I would suggest that you take out the insurance (depending on it's cost). awesome week. Very quiet and secluded. Golf course at StoneLedge was beautiful. Be sure to check in with Sunset Rentals to ask for a discount to play golf. They did not tell us about it when we made the reservations. Also check the other courses for discounts. They have a tendency NOT to let you know there are discounts!!!! 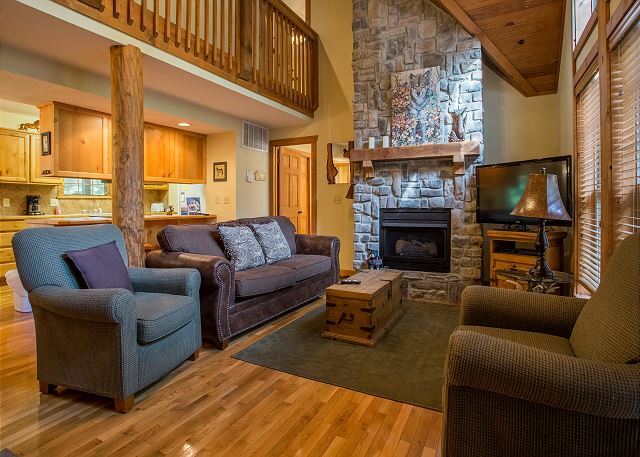 We're glad that you all had a good time at this lodge and hope to see you back for your next getaway! Wonderful house. 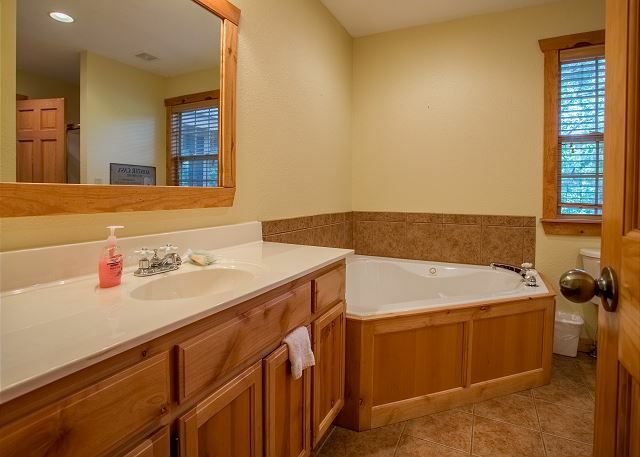 The four bedrooms and bathrooms gave everyone their own space. We were even able to turn one of the bathrooms on the first floor into the nursery for the one-year old. Enjoyed the area swimming pool and playground areas. The kitchen was pretty well outfitted. Liked being able to put the kids to bed and the adults enjoy visiting and playing games. Would definitely stay here again. Thank you, Kathy. We hope to see you back soon! Be sure to mention that you have stayed with Sunset before to receive your Repeat Guest discount. BEAUTIFUL CABIN HOME,could have stayed forever,my family and I had a great time. It felt like home. We are very happy that you enjoyed your stay, Debbie. We hope to see you back in Branson soon! Each year the family all comes together for a few days in July. This year Branson was the choice of destination. This house was a perfect place for a larger group as each bedroom was a get away in itself. Thank you for your review, Tammy. We hope to see you back next July - if not sooner! We would stay here again. The location was perfect for us. The cabin had everything we needed--fully equiped kitchen, washer/dryer, and activities for the kids in the complex. It had a great pool and playground for the children. Thank you so much for your review, Pam. We are glad that you enjoyed your stay and hope that you will return soon!